NetFlix on Xbox sounds good; Roku … meh. So the NetFlix Roku device is available for instantly watching downloadable movies and TV episodes on your TV. This is appealing to me because I got rid of my cable bill. In my opinion, cable is a huge rip off. I’d rather subscribe to two NetFlix movies at at time and watch Hulu or NBC.com for The Office or something when I get the urge. Otherwise, I don’t watch TV. I haven’t taken advantage of the “unlimited” streaming movies from NetFlix because I’m usually doing something if I’m at the computer. I’m not usually watching a movie from my laptop. I might watch something occasionally though, if I could watch it on my TV with my wife or son. The Roku sounds like it’s a really cool device. It looks easy to set up and sounds like it does the job it’s supposed to do. But do I really want a $100 block on my entertainment center? The Xbox option sounds better. I have to confess something. I do not own a next-gen console of any kind. No PlayStation. No Wii. No Xbox. 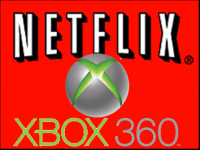 So, a future Xbox model with NetFlix support sounds pretty cool. Especially if it has BluRay, too.